this fast post regards the FLOSS openMVG. 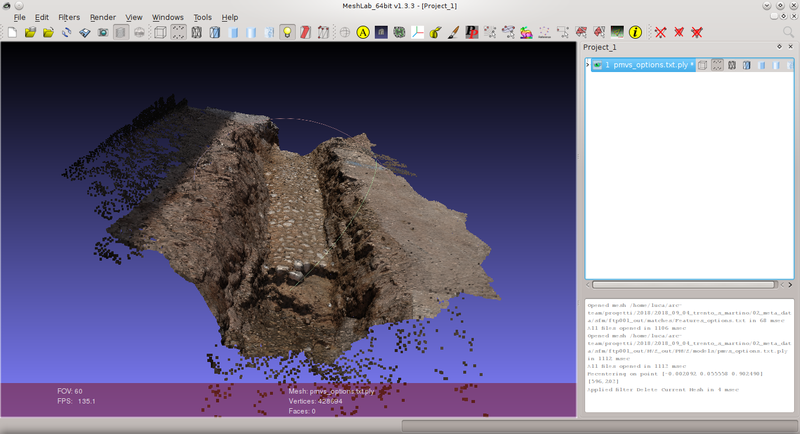 This software is our first choice in documenting archaeological evidences in 3D (via SfM), from the ground level (for Aerial Archaeology we often use MicMac). Due to the fact that, in the last years, we started to gradually abandon a simple 2D documentation, our use of openMVG increased significantly. For this reason we developed a small script to speed up the use of this software (without its GUI: openMVG-GUI), adding some preliminary operations (like a general quality reduction of the pictures via ImageMagick) and registering some statistics about the whole process. 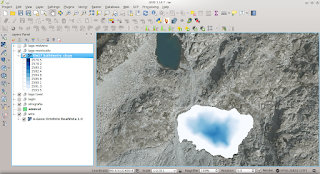 The script is released through the GNU General Public License and it is freely downloadable here. At the same address (on GitHub), you can help us in improving the script. Like always, any kind of help is be greatly appreciated (also simple language translations, since the script is currently in Iatlian). In the next future we would like to use ImageMagick to add a variable to the script, in order to optimized pictures for underwater 3D archaeological documentations, following the methodology we used in some of our past missions. 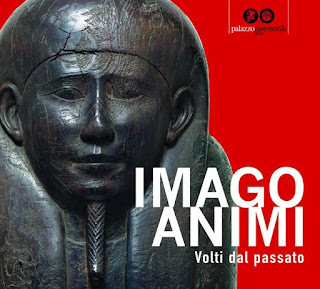 I am very happy to write this post, because finally the catalogue of the Open Source exhibition "Imago animi. Volti dal passato" (en: "Iamgo animi. Faces from the past") is freely available online. This has been possible thanks to an agreement between the Municipality of Cles, which hosted the exhibition, the editors and the publisher of the catalogue. This post is related with the Wikipedia editathon we are organizing for the open source exhibition "Imago Animi", a project derived from the previous experience of "Facce. I molti volti della storia umana". 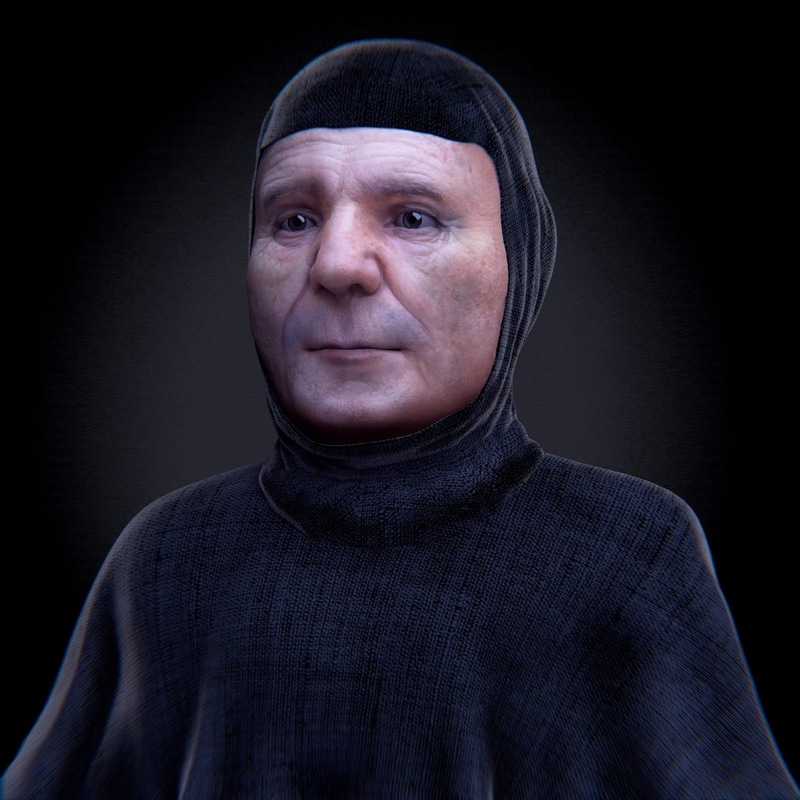 This time I will write about the experiment in facial MoCap we performed with the 3D model of the FFR (Forensic Facial Reconstruction) of Francesco Petrarca. The poet was indeed one of the five historical personalities connected with the city of Padua, who were the protagonist of a specific session within the exhibition "Facce". Moreover Petrarch is also present in "Imago Animi", due to the fact that its mortal remains were studied by the scientist Giovanni Canestrini, born in Revò, a town very close to Cles (Trentino - Italy), where the exhibition is currently open to visitors. 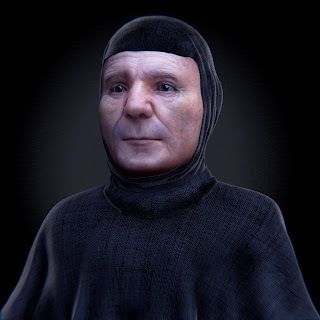 The image below (Creative Commons Attribution 4.0 International License) is the result of the Forensic facial Reconstruction of Francesco Petrarca, performed starting from the cast of the skull, found in 2005 in the "fondo Canestrini" at the University of Padua. This cast is the only data available for the FFR, because, as the 2013 recognition on the mortal remains revealed, the skeleton of Petrarch is currently buried with a female skull, dated (with the C14 techniques) between 1134 and 1280 (almost one century before the life of the poet). The aDNA analysis performed in 2004 by Prof. David Caramelli (University of Florence) confirmed this thesis (the skeleton had a male DNA, while the skull a female DNA) . In 2015 Arc-Team has been commissioned to perform the Forensic Facial reconstruction of Petrarca and other historical personalities, in order to prepare the open exhibition "Facce". The work started with the 3D documentation of the cast of the "fondo Canestrini", done (with SfM techiques) by Luca Bezzi (Arc-Team). The cast was previously validated by Dott. Nicola Carrara (of the Anthropological Museum of the Univesrity of Padua), with osteometric measurements based on the drawing published by Giovanni Canestrini on his study about the mortal remains of the poet . Cicero Moraes, the forensic specialist of Arc-Team, later performed the FFR in Blender, with the techniques developed during the years starting from this first post in ATOR: Forensic Facial Reconstruction with Free Software. Once achieved the final 3D model, we decided to test Blender potentialities in facial MoCap, starting from previous experiences. In this case the idea was a short video in which Francesco Petrarca would have "reciting" one of its poetry and, in particular, the proemial sonnet of the Canzioniere ("Voi ch'ascoltate in rime sparse il sono..."). ... while this video shows the "making of". For the two open exibitions ("Facce" and "Imago Animi") has been chosen a combination of the previous videos, in order to show also the technique of facial MoCap. The final product, you can see here below, has been performed by Cicero Moraes (Arc-Team) using the facial MoCap tools of Blender, starting from the original video registered by Luca Bezzi (Arc-Team), with the technical help of Dott.ssa Emma Varotto and Dott. Nicola Carrara (Anthropological Museum of the Univesrity of Padua), which recorded the excellent performance of the actor Antonello Pagotto. This post wants to be also a tribute to all the people involved in the project, for their professionalism and kindness! sorry for the long silence, but working in archaeology and cultural heritage is not a simple task and this year we had very few time for our open projects and, consequentially for ATOR. This new post is to report that in 2018 we went on with the open source research about "Facce. I motli volti della storia umana" ("Faces. The many aspects of human history"). The new step consisted in the opening of a new derived exhibition, called "Imago Animi. Volti dal passato" ("Imago Animi. Faces from the Past"), hosted in the Councilor's Palace (Palazzo Assessorile) of Cles (Trentino - Italy). One of the goals of this new event is to go on with the scientific dissemination of the open source material produced until now and regarding the topic of the human face, under an anthropological, archaeological and artistic point of view. To speed up this work, we are trying to organize a wiki editathon which will be focus on the exhibition "Iamgo Animi", in order to enrich many of the pages of wikipedia which are connected to these arguments and to upload old and new facial reconstructions, done during the preparation of the event. 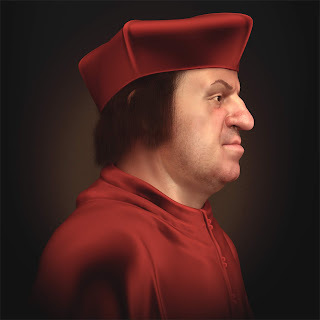 As an example, I post here the reconstructive portrait of Bernardo Clesio, the Italian cardinal, born in Cles, who was the main contributor of the famous Council of Trent. His facial reconstruction is one of the new work done by @Cicero Moraes (Arc-Team expert in 3D forensic facial reconstruction) for the new exhibition. These images are also particular because they are not done through the forensic facial protocol we developed during the last years here in ATOR, but rather with a new iconographic technique, based on the art-historical study on the known portraits of Bernardo Clesio (performed by Marcello Nebl), validated by a comparison to select the the common facial features (performed by @Luca Bezzi), in order to achieve a philologically reconstructed 3d portrait (modeled by @Cicero Moraes). 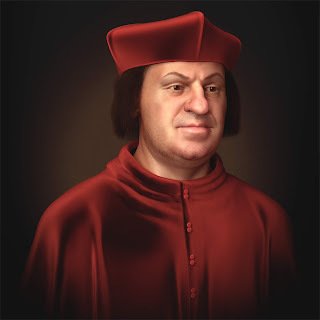 This workflow has been necessary because it has not been possible to organize a forensic study on the remains of the cardinal (deu to the strict time table of the preparation of "Imago Animi"). Here below are the two iconographic reconstructive portraits performed with the technique described above. Like always, the material uploaded in ATOR is licensed under a Creative Commons Attribution 4.0 International License. I hope this post was useful and that the editathon will give a small contribution to the Wikipedia project. 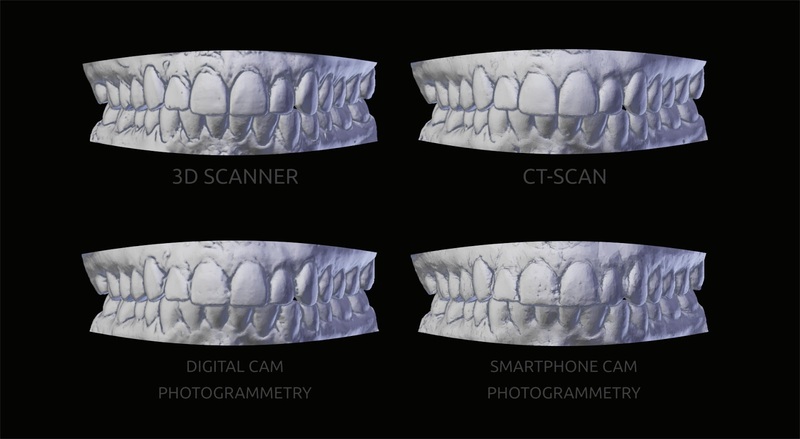 Could open photogrammetry be an alternative to 3D Orthodontics? The effectiveness of scans by intraoral scanners is undeniable. 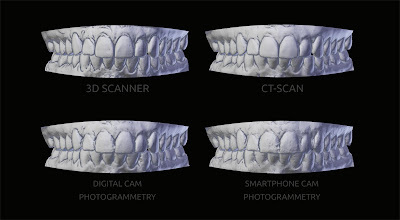 These are the gold standard and reference of any professional who wishes to use the new 3D technologies for planning procedures involving orthodontics. However, while these technologies meet the needs of the market, they also stand out because of the high costs. Few professionals, taking into account the whole, have access to these means in a constant and unrestricted way. The purpose of this material is to offer an affordable alternative to those who want to enter the world of 3D graphics, but do not have the means to enjoy powerful and expensive machines. The objective is not to criticize the values, since, in the face of the investments and the results are quite coherent, in addition the world is very big and has place for all. What we are doing is just showing a way to achieve compatible results, with due limitations, on those produced by market references. Open source software can be used from the beginning to the end of orthognathic surgical planning and rhinoplasty? Do open photogrammetry tools provide results compatible or at least close to paid and closed software? These and other questions will be answered throughout the vast documentation made by us. In it we scanned 106 face models and compared a series of programs and tools. It was many days of intense work and at the end we put another photogrammetry solution for Blender through our OrtogOnBlender addon. this second, brief post is intended to share other open data regarding our underwater archaeology mission in the inland waters of Trentino (Italy). As you know, this summer, we joined the exploration of the lake Monticello (almost 2600 m asl, near Paradiso Pass), looking for evidences of the WW1 in the Adamello front. If you missed the post, I described here the new methodology we used to achieve a complete 3D bathymetric chart, using just a low-cost sonar sensor. Today I just uploaded on our server the 3D data, so that other researchers can use them, if they will find them of some interest. 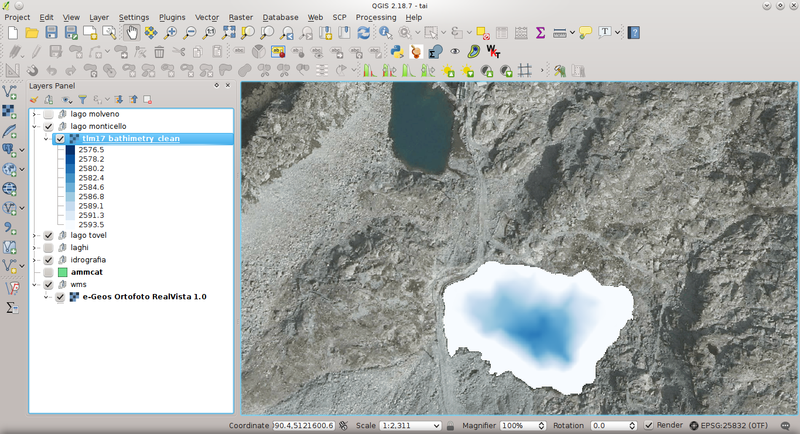 Lake Monticello 3D bathymetric chart by Arc-Team is licensed under a Creative Commons Attribution 4.0 International License. I hope this data will be useful. Have a nice day!